Artificial intelligence is reaching new heights. The concept that machines can be developed to perform tasks which require intelligence when the same tasks are completed by humans is called Artificial Intelligence. A great deal of people currently own a form of artificial intelligence, with an increasing amount of Australians owning a smartphone. 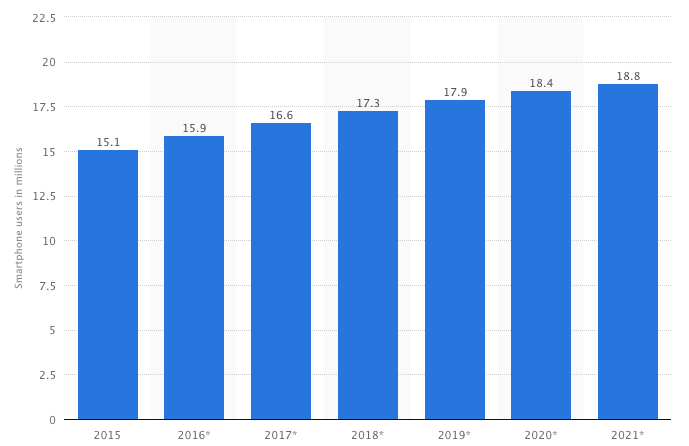 These numbers are said to increase in the coming years to 18.8 million by 2021 (see graph 1). Artificial Intelligence (AI) can encompass anything from SIRI in iPhones, to the algorithms used by Google and Facebook, to Snapchat’s facial recognition, and to even IBM’s new Watson. While at the moment AI technologies can only outperform human ability on a limited amount of tasks, new developments are progressing rapidly, and have the potential to shake up various industries on a global scale, as these machines become more and more capable of outperforming humans at nearly every cognitive task. While AI is progressing relatively quickly, it is important that the impact of these technology advances remains beneficial to society as a whole. It is important that the technology does what it is supposed to do, particularly when it comes to self-driving cars, self-flying airplanes, pacemakers, etc. In the long term, it is becoming increasingly important to understand what will happen when AI is able to outdo humans in cognitive tasks. This system would have the potential to improve itself automatically which might trigger an ‘intelligence explosion’, far outgrowing human intelligence. This super-intelligence could have disastrous effects on humanity in some cases if it were able to revolutionise technology beyond our control, however at the same time this might assist with the eradication of war, disease, and poverty. 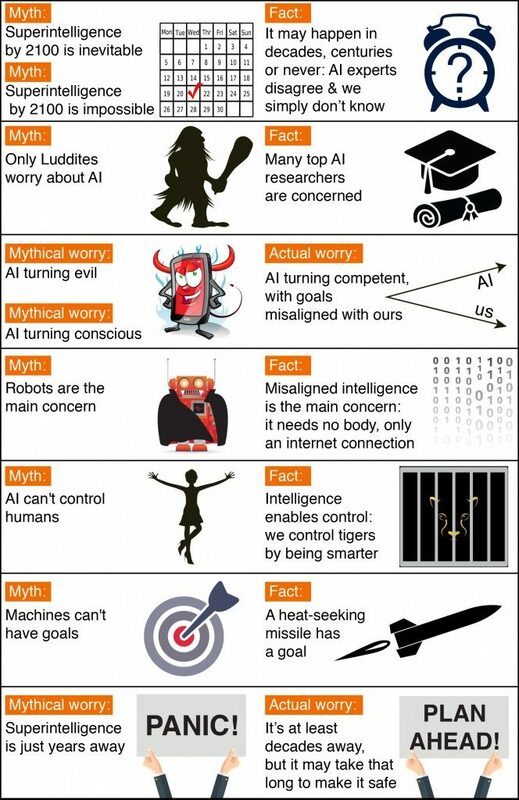 The image below indicates some concerns and facts surrounding AI. Source: Max Tegmark @ The Future of Life Institute. While there are concerns surrounding super-intelligence, AI is still a fairly new technology. This week, Apple announced that it would launch an artificially intelligent home speaker, which utilises SIRI to carry out internet tasks. Apple is said to position this device as more premium in comparison to others on the market, such as Google Home and Amazon’s Echo, as it is set to have improved acoustics and computing power. IBM have recently announced their new AI technology named Watson. This technological advancement is set to shake up businesses, with the capacity to engage in online dialogue and interactions, creating natural conversations between applications and users. Watson Discovery will also have the capability to digest and analyse unstructured data. This AI is currently, and set to be applied throughout various industries, including healthcare, chatterbot for children’s toys and applications, teaching, weather forecasting, and preparing taxes. With these developments yet to come, as well as the potential for further advances in AI, it is no surprise that this technology could not only change the business landscape, but our lives as well.